Sad Max is a short film that kind of looks like a musical, kind of looks like a vlog, and kind of looks terrible. 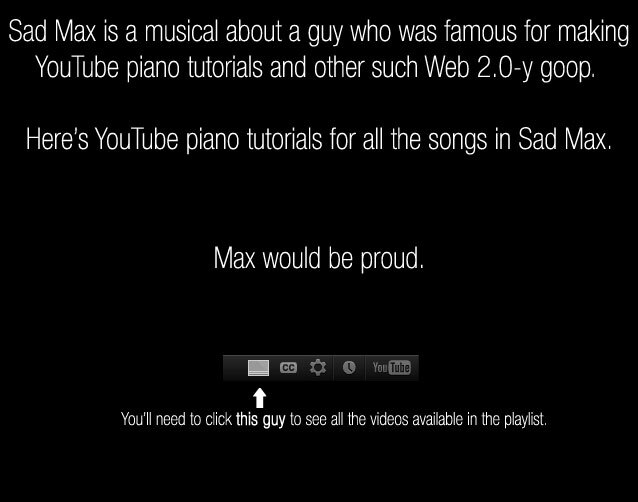 Max was a pretty high-profile YouTube user back in the day, posting tutorials and cover songs on his channel and struggling with his inability to actually write music he liked. Then something something apocalypse. Now, he finds himself unable to leave his basement without dying of whatever has killed everyone else... as well as without food, water, or an internet connection. And even if he did, who's alive to watch him? And even if they were, who exactly was watching before? To stave off psychosis and massive existential crisis, he assigns himself the one task he had always put off before: writing a musical. Email me at teague [dot] chrystie [at] gmail [dot] com, follow me on Twitter at @TeagueChrystie. Find my other internet video-y stuff at YouTube, username TeagueChrystie. Why did you do this? This is pretty dark material. Do you need a hug? Yeah, I know. I like hugs. I did it for fun, basically, I was planning on having some time off from my normal-person job as a VFX artist and graphics dude, and wanted to have a project to play with during the break. And since I generally don't like to get too many other people wrapped up in my madness, I decided to make something that I could do all by myself. That said, "by myself" is misleading. Without Jim to help produce and Brian to lend me his equipment, there'd be no Sad Max. Couldn't this have not been a musical? Well, cart before the horse, there. I had written a musical before (a satirical, sentimental mouthpiece for my nostalgic opinions about Hot Topic, called "Pop Gothic") that I was very proud of, but couldn't possibly make. It was just too expensive on all fronts. So the particular impetus for this whole Sad Max thing started as "Figure out a way to make a musical with absolutely nothing but existing assets." I had an upright piano, I had access to a camera - thanks, Brian - and I had myself. There were nothing but liabilities in that; I'm not an actor, I'm REALLY not a singer and have never made something anything like this before. But I knew I could focus on myself for those problems. There was nobody to cast, no locations to rent, and two months to do it. So the project was never going to be anything BUT a musical. That said, as a thought exercise? 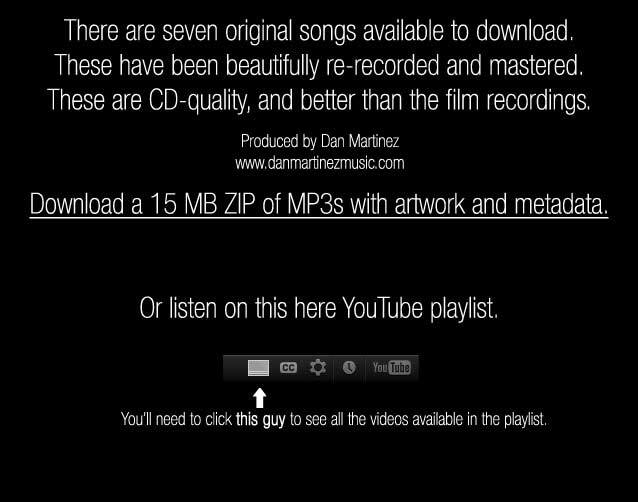 Sure, you could do this without music. The thing is, music is so tied into it. It's from the perspective of a guy who deconstructs musicals, a guy who's played original songs and done tutorials and covers for millions on YouTube, his very character would be different if he wasn't this obnoxious web personality who loved music in his previous life. So it's pretty fundamental. I don't know, I guess I'm contradicting myself. I'll just say "if a more talented and compelling actor was involved, probably could have been a normal short film." As a side note, I've debated with myself about whether to even call this a musical. It's really not, when you think about it. It's a movie about a guy writing a musical, and he plays you what he's come up with. It just ceases to be a thought-project and becomes the most important thing to him as the show goes on, and edges into his actual psyche by the end of it. Alright, fine, it's a musical. Is this a comment on YouTube personalities? This is a comment on Max. Max is an amalgam of a hundred different folks I've seen on Youtube, none of whom are as ridiculous as he is, and none of whom are direct influences. At the end of the day, Sad Max is an argument against a straw man. (A "straw man," by the way, is a debate precept that refers to inventing a villain to pit your argument against, instead of addressing the actual people who are debating you.) It's easy to show the audience what's wrong with Max, and then get onboard with enjoying his change of character, because he's a straight-faced parody of internet culture. If he was any more complicated, I'd need more run time. Ahem. Not to say there's not people exactly like, or worse than, Max. I just don't know any of them. That said, among the many influences for Sad Max - not who he is, or how he presents himself, or how he's doing it - are the vlogbrothers. There's a bit of character in the editing itself, because towards the beginning you can tell by way of edits that Max is still obsessed with the jump-cut style of video blogging, which is something that I most associate with the vlogbrothers, and by the end he stops caring enough to edit his takes. Ze Frank and Wheezy Waiter and others are who John and Hank credit as influences, but for me, it still comes back to them Green boys. To bring this question in to land: no. It's a comment on a guy who got obsessed with one thing and kept putting off another, and his obsession happened to be his internet fame. This project was produced by Jim Frommeyer, someone who I only met after the first round of shooting and had only dealt with online before that. Jim was a constant sounding board throughout every phase of the show, and was watching me film on webcam with a little camera that sat next to the "real one." He'd give me feedback on how the performances were going, give me ideas, we'd make changes to dialogue on the fly, and he exemplified that one thing that producers are best for - just getting his head into the project and really being in it with me. I don't know if this film wouldn't have been possible without Jim, but it would have been much different and probably way worse. This is the third time I've worked with Jim, previously we collaborated (with him doing most of the work) on a video bumper for my podcast Down in Front, and also a minor viral-ish video-ish thing about the twisted, horrifying snowmen Calvin would make every winter in Calvin and Hobbes. Did you really kill a fish for this project? What was interesting to me as I started to show early cuts of the film to a handful of people is how sad they were about Gary dying. Which is great for me, because that's what I WANTED, but. Aw. Now I'm sorry. I didn't mean to hurt anyone's feelings, I just, you know, had to kill the fish. And I'll say it once and for all: Max thought about it, and he couldn't eat him. He hated himself for not being able to eat Gary and squeeze another ounce of energy out to maybe finish the musical, but he hated himself more for even thinking about it. There's actually takes of a couple of scenes where I refer to "I can't eat Gary," I just didn't end up using any of those takes, and so the question remains. The filming process happened in three chunks, separated by two months and one beard. After writing the script, I decided - without makeup or beard changery - to film the whole damn thing on my Flip camera and cut it together to see what I had. It was basically an animatic of the entire movie made in the exact same style as the real movie. The result was, I had a very clear sense of what needed to change, what I needed, where I lost people, etc.. The vision for the show tightened. Rewrites happened, and in the beginning of December I shot the thing over the course of a week, starting with the end of the musical and working - and shaving - my way back to the beginning. Cool. Movie filmed, face no longer hairy. I edited it together and... you know what? Still not quite there. I wanted to do some reshoots, and a make a couple fairly major changes. The beard began anew. I had to wait until the beard grew all the way back out to film again. That happened in the end of February. Over the course of another week of filming, we (myself, Frommeyer, and Jeffery Harrell) got it. All of the footage in the can, and it only took three months. Plus a month's worth of writing and assembly on either end. What were the challenges aside from musical composition? Oh my god. Well, let's run down the list. 1., and this is a big "1," I'm not an actor at all. I have never acted. And the challenge of that was simply, you know, my face is the only thing on screen for thirty minutes, and my face is connected to a dying brain and body. Lots of emotions and feelings and contradictions and... sigh. It was a lot harder than I expected it to be, for even the crappy performance you see before you. 2. I'm also not a singer. Ha! What the hell am I doing! I've been trying to get better at singing since I started playing piano a few years ago, at which point I could not sing at all. But no vocal training or anything like that, which explains why Max isn't a very good singer. Neither is Teague. 3. I'm also not a writer, editor, or songsmith. Fake it 'til you make it is the over-arching production motto of Sad Max. How did you balance audience interest and expectations with what you wanted to do? Were you aware that some people would be expecting or hoping for a different ending? It didn't really enter my mind, really. I have no idea what anyone wants, and I've known since Jump Street that this was going to be the most unlikable project ever. Especially coming on the heels of my previous collaboration with Jim, the Calvin and Hobbes thing, that went from zero to hundreds of thousands of views overnight and was on The Onion's AV Club and Crave and myriad newspaper blogs and various other portals... my thirty minute self-indulgent YouTube musical with one camera angle and bad songs was not going to be a hit. So I factored out all the ways this idea COULD be executed - funnier, shorter, longer, webseries, etc. - and just went for what I wanted to do. For better or for worse.